It has come to our attention that you have registered StabNetstar.com (the "Domain Name"). 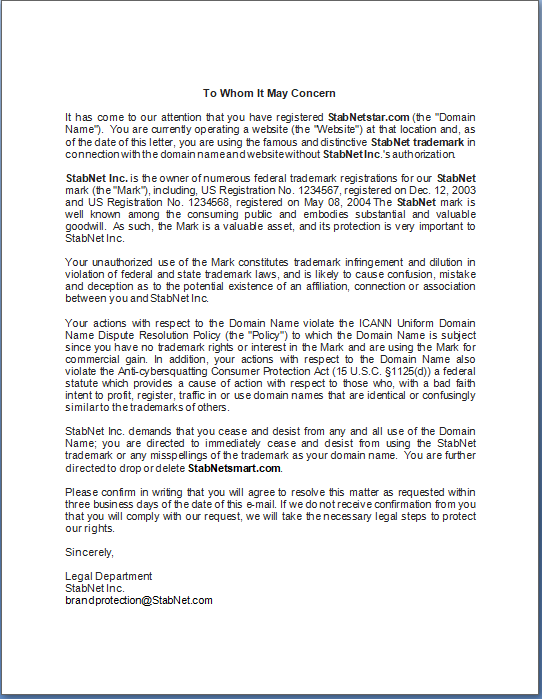 You are currently operating a website (the "Website") at that location and, as of the date of this letter, you are using the famous and distinctive StabNet trademark in connection with the domain name and website without StabNet Inc.'s authorization. StabNet Inc. is the owner of numerous federal trademark registrations for our StabNet mark (the "Mark"), including, US Registration No. 1234567, registered on Dec. 12, 2003 and US Registration No. 1234568, registered on May 08, 2004 The StabNet mark is well known among the consuming public and embodies substantial and valuable goodwill. As such, the Mark is a valuable asset, and its protection is very important to StabNet Inc. Your unauthorized use of the Mark constitutes trademark infringement and dilution in violation of federal and state trademark laws, and is likely to cause confusion, mistake and deception as to the potential existence of an affiliation, connection or association between you and StabNet Inc. Your actions with respect to the Domain Name violate the ICANN Uniform Domain Name Dispute Resolution Policy (the "Policy") to which the Domain Name is subject since you have no trademark rights or interest in the Mark and are using the Mark for commercial gain. In addition, your actions with respect to the Domain Name also violate the Anti-cybersquatting Consumer Protection Act (15 U.S.C. §1125(d)) a federal statute which provides a cause of action with respect to those who, with a bad faith intent to profit, register, traffic in or use domain names that are identical or confusingly similar to the trademarks of others. StabNet Inc. demands that you cease and desist from any and all use of the Domain Name; you are directed to immediately cease and desist from using the StabNet trademark or any misspellings of the trademark as your domain name. You are further directed to drop or delete StabNetsmart.com. Please confirm in writing that you will agree to resolve this matter as requested within three business days of the date of this e-mail. If we do not receive confirmation from you that you will comply with our request, we will take the necessary legal steps to protect our rights.